Son has finally found something he loves ... glasswork! He's been doing a lampworking class at the Canberra Glassworks this month (4 x 3 hour sessions), and is excelling. He's the youngest student in the class (middle aged women are the norm! ), is very adept and a quick learner. His goal is to learn to make (and sell) glass body jewellery, like the stuff here. There is currently no-one in Australia making this sort of body jewellery, and there's definitely a market! He and Dotter have to buy all their glass jewellery from the States. So we're not talking 'pretty beads' here, but glass jewellery for people who are into body modification (as both my kids are). Labrets, plugs, pinchers, twists, and so on. The next step is further training with this guy (about 120 km from us), and the purchase of the equipment (small kiln, blow torch, mandrels, glass sticks, safety gear, and so on). He has the requisite balance of artistic and design talent, with handicraft skills, connections to the body art & modification online community, and obsessive interest (one of the occasional pluses of Asperger's). This is the most positive development for Son in years. Here's hoping he can gradually reach his goals! Considering that he's been unemployed with practically no goals for the past 3 years, this is a big step forward, even if there's only slow progress from here (there have been a lot of disappointments and false starts in the past few years, so I'm trying to be realistic). I'm very proud of him. And relieved. Yup, definitely relief in there too. And here's your Miss Petal photo for the day. She turned 1 on 14 March, and this is her birthday jumper (Rav link to the pattern). Love the beads - can't believe they are made with only a couple of lessons! What an uplifting post! His work is wonderful for a beginner, in fact wonderful full stop. Good luck to him and I really hope that his ambitions are fulfilled. A friend of ours did a class at that place - a middle-aged man, at least slightly different to the norm! - and loved it, though I don't think he has carried on with it. Oh such great news! What a thrilling thing for him to have discovered. I adore glasswork. Those beads are lovely and I can see there must be a market for the body mod stuff he's looking into! Pretty, pretty! As an artist yourself, you know that it is one thing to create and another thing to market. Best of luck to Son and family in this process!! He seems to be particularly well placed for this. Petal is such a dear. And what a beeyootiful sweater! That's great news! His glass looks fantastic! I'm glad he's enjoying it. 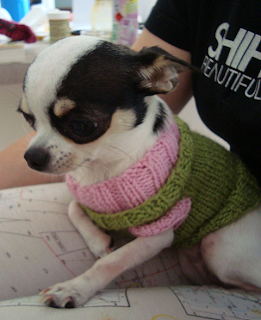 Petal is super-cute in her sweater. I might just make one for each of the cats! Those are beautiful beads. You can see he has your eye for color. I hope this works out for him. I have a daughter with ADD who has yet to find her place. It's frustrating as the parent and every little bit of hope is welcome. How exciting!!! One of many projects on my list, glass blowing. I love Ms.Petal's b-day sweater. What a great mommie. 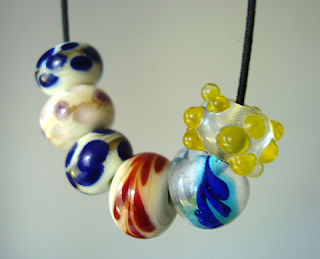 I really envy your son being able to make such lovely beads. This is something I've always wanted to try. Good luck to him. I'm so glad he's found something he's not only obviously good at but also really enjoys. I love the blue and white ones. 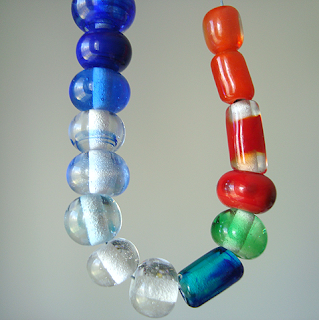 I love beads - if only I knew what to do with them! great news Denise! I'm so happy for you, and him, that he has found this talent and a plan as well. The beads are lovely. That is better than good for a beginner. I was into stained glass and a guild member but never could get the hang of hot glass.